But who really cares? Any Trump tweet or football result is more important to our media and politicians. The members of the UN still give the world’s military about 340 times more than the UN for its core budget. You often hear people raising doubts about the “the United Nations” and most people then think of the skyscraper in New York as “the UN”. But there is no “UN” independent of what the 193 member states decide to make of it. That was already pointed out by its first Secretary-General, Norwegian Trygve Lie, in the late 1940s: The UN will never be stronger or better than the member states want it to be. That is the essential – and in some sense also existential – truth about the world’s potentially most important and visionary organisation. A second truth is that the UN is not, at least not predominantly, the power house in New York (which, in passing, ought to be moved out of the US given the decade-long contempt for the UN Charter shown by that member). The real UN is the family of UN agencies that do good around the world every day and without which the world would be a much worse place. A third truth is that a few predominantly Western states – the U.S. in particular – have done their utmost at least since the 1990 wars in Yugoslavia (and some would say since Korea and Vietnam) to undermine and marginalise the world organisation. Those and many other member states violate the UN Charter’s Article 1 which states that peace shall be established by peaceful means on a daily basis, misuse the organisation – the Five Permanent Members in particular with their nuclear weapons and repeated violations of international law. Think of all the wars fought since Yugoslavia without a UN Security Council mandate but have destroyed countries, peoples, economies and cultures. If they could, they would love to get rid of the UN once and for all. Because it is based on a Charter that is the most Gandhian governments have ever signed. Back in time, that is, when governments and peoples knew what war was and therefore stated in the Charter’s Preamble that war shall be abolished as a socially acceptable institution – to boil it down to essentials. And where are we then today? Well, did you hear any of these states – the UN Security Council members in particular – insist on the point that large, robust UN peacekeeping missions should be established in, say, Libya, Syria or Ukraine? No, it is Russia and the US that keep the “peace” in Syria, right? The truth is that the US has done nothing there but to support various other militant countries and terrorist organisations and to build some 15-20 bases there. The UN wouldn’t have done any of that! And while Russia (and Iran) have certainly had a relatively positive influence on the Syrian battlefields fighting terrorism, it is still warfare and not peacemaking. And peace – mind you – is not the same as a war dying down. 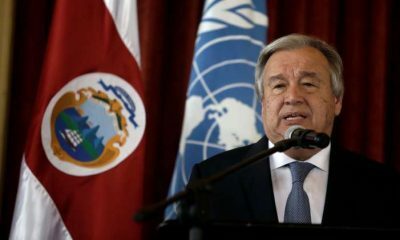 Self-appointed peacekeeping countries that are happy to have demolished the finest global organisation on earth are now doing – with nothing but tragic results – what the UN could have done much better had the world’s governments wanted it to and had they built on the accumulated UN experience since 1945. Rampant militarism, nationalism, interventionism and anti-intellectualism among national “security” elites and political decision-makers – even in historically peaceful and humane countries such as my native Denmark – for decades have fought a war on peace and thus – perfectly logically – on the UN. When Srebrenica happened and know-nothing people blamed it all on “the Serbs” and “the UN”, who bothered to investigate how the member states deliberately blurred mandates and caused mission creep? How leading NATO countries’ military strike projects (the stupid “peace enforcement” doctrine) was devastating for the UN peace-keeping? Who in the media asked politicians in all leading UN member states why they dispatched far too few peacekeepers – and how countries had provided the UN peacekeeping missions in Yugoslavia with less than 5% of what the UN peacekeepers estimated to be a minimum at the time to prevent things like Srebrenica from happening in the five other “safe” zones? The then top UN Commander Lars-Erik Wahlgren required 32,000 peacekeepers from the world community and got 1200 Turks to Bosnia. That is 3,75% of what was needed! So yes! And how easy – just blame it all on the UN! Had anybody bothered to investigate the UN’s situation, they would have found that members avoided paying their dues so that the UN was de facto bankrupt when Srebrenica happened and would then be sure to fail. Such investigative journalism would have required more free media and research and it would have prevented all fingers being pointed at “the Serbs” (whose leader, Slobodan Milosevic in Serbia, had been called the mastermind of the massacre but was freed in two verdicts by the Hague Tribunal ten years after he died in his cell). Another story not to be told? To cover up NATO countries’ remarkable ignorance coupled with a series of more or less law-violating efforts which all amounted to one thing: Peace prevention! And then you may think: But the UN is also very expensive, isn’t it? No, it is extremely cheap! 112 of the 193 members have paid their dues. OK. Some are unable to. OK. But then there is the United States of America paying 22% of that UN budget. Ask why others let it dominate the world institution instead of paying more themselves so the U.S. cannot dominate. So we arrive at the terrible truth about war and peace budgets in our crisis-ridden world: The UN member states, pooling all their resources to provide the world’s most important organisation for peace, human rights, development etc. with a decent core budget, cannot find a little more than US$ 5 billion! What do the same member states spend on their military, on warfare, death and destruction? About US$ 1700 billion!! Of which the United States alone around 700. And did we ever hear of a war stopping because of “funding issues”, delayed payments or forced military staff reductions? In summary: 340 times more is spent on “security” and war than on the world’s best, common peace organisation’s core budget! Until the world begins to seriously question the Present Perverse Priorities (PPP) and change them fast as hell – what hope would you see for humanity’s future? Watch your prime time TV news tonight. Read the best newspapers you know of. Listen to the debate in your parliament – or to your next dinner table conversation. And write to me if you hear anyone bringing up this world priority issue with urgency and passion or states that she/he will lift a finger to change those PPP in concrete, radical ways. No matter how many reforms the UN needs – and yes it does – it is the member states that prevent them from being implemented. No matter how weak the UN is made by these narrowminded, warfighting states and their elites, the UN – its Charter, its idea, its professional and committed staff (I have met hundreds of them, civilian and military, around the world and admire them greatly) – will have my 110% support. And dare you to demolish it further before humanity has something new and much much better to switch to. Pay your dues! Increase them at least 100% within the next five year. Or your talk about a better world is empty and opportunistic cynicism. Stand by the UN, its norms and Charter! And do it now!